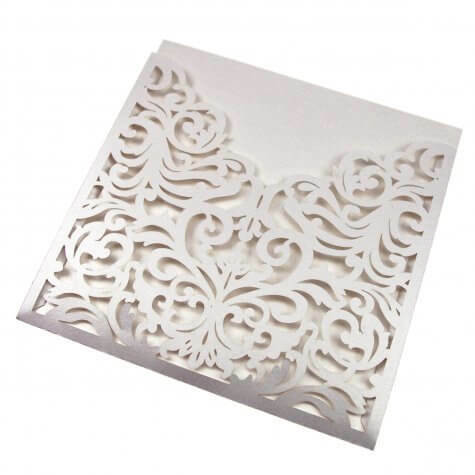 Our blank laser cut stationery is perfect for creating luxurious wedding stationery. Since the outers are blank but so beautifully patterned they can be made into day and evening invitations and other items of wedding stationery if you wish. Each laser cut design is intricately cut and is ideal for creating a wide range of invitation styles from Vintage to English Country Garden. The laser cut outers can be matched simply with a printed insert and left 'as is' or they can be further embellished with ribbon and diamantes if you really do want to 'go to town'! Our laser cut cards are sold individually so that you can mix and match with our card stock ranges; beautiful, versatile and totally irresistible, they do all the hard work for you! 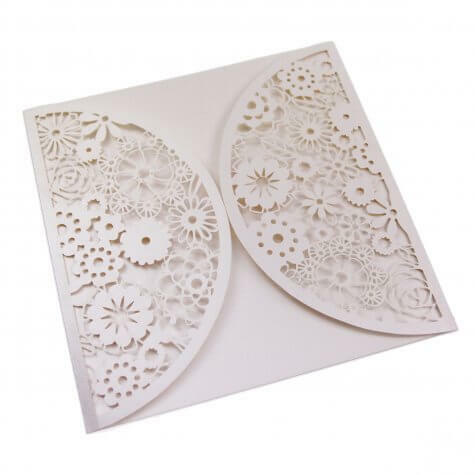 Laser cut wedding stationery can be so intricate and pretty with designs that can only be acheived using this method of manufacture. The beauty of the design lies in the fact that while looking incredibly complex it really is possible to add very little else for an invitation with the all important 'wow' factor. Whether you decide to add additional decoration or not the final invitation will be stunningly beautiful. Laser cuts are a brilliant way for the DIY'er to create something intricate and beautiful with the minimum of effort! The hard work really is done for you. The delicate lace-like designs are ideal for making stunning wedding invitations as they're so pretty and detailed. Add contrast with ribbon bows or pearlised card 'wraps' and sparkle or lustre with diamante or pearl embellishments. Alternatively keep your design classically simple and just pop in or attach a printed insert. With wallet and gatefold styles there's flexibility as well as convenience with a laser cut style wedding invitation.